The Martynas Mažvydas National Library of Lithuania presents two exhibitions for its opening after reconstruction: an installation with a floating tape by Žilvinas Kempinas, a famous expatriate artist and winner of the national prize, and an exhibition A Postcard to Vilnius – Love, George (Atvirlaiškis Vilniui – su meile Jurgis). Having made his debut in the first half of the 90’s as a scenographer and creator of interactive works, Žilvinas Kempinas is one of the most famous modern artists representing Lithuania in the world. He combines meditative and intellectual implications with technical solutions that require special precision. Kempinas’ installations often depend on the technological solutions; however, these do not drown the meaning and essence of the works, but, paradoxically, often contribute to the dematerialization of the works and meanings. Žilvinas Kempinas is presenting one of his classical works in the National Library: a tape perpetually flying and dancing in the air between the special fans – a symbol of the victory of an idea or dream against matter. Fluxus is an international avant-garde art movement of painters, musicians, designers, architects, film artists, etc., which started in early 1960s in New York (USA) and soon spread to Western Europe. Its most characteristic features are bringing art and daily life together and the idea of art as a joke, de-elitized and accessible to all. An important fact is that one of the founders and leaders of this avant-garde movement was a Lithuanian George Maciunas (Jurgis Mačiūnas). Although Fluxus as an avant-garde movement still exists in small individual foci, it has lately been raising more interest as a peculiar object of the history of visual art, an attribute of a certain era. Thus, the name Fluxus is gaining in weight and status. The museums of the world hold just a few collections that comprehensively introduce the Fluxus movement and we are proud that Vilnius owns one of them. 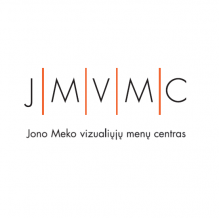 This collection is currently at the disposal of the Jonas Mekas Visual Arts Center. The National Library presents part of the Fluxus collection: design and graphic works, objects and postcards by George Maciunas. 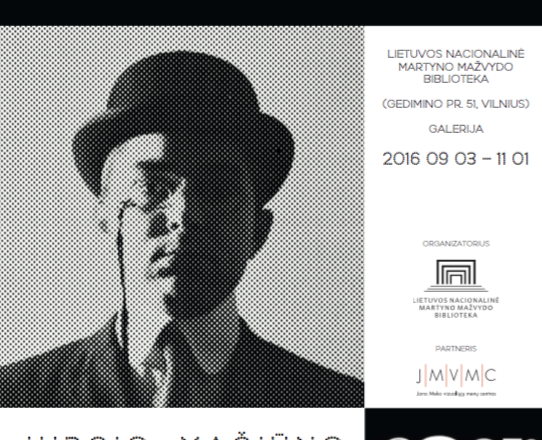 This exhibition is the result of cooperation between the National Library and Vilnius City Municipality with a view of better introducing the Fluxus collection to the public and continuing the non-standard creative, educational, and exhibition activities. Fluxus is a multifaceted movement, which disregarded the boundaries of art types and genres and brought together many forms of creative anarchism. One of the essential threads of the Fluxus movement (and the collection of Fluxus artefacts) binding nearly all Fluxus publishing (books, posters, flyers, author books, etc.) together and having become a symbol of Fluxus is the design created by George Maciunas, including a special Fluxus font. In general, the whole eclectic and playful collection, ranging from copyright works to documents, photos, posters, artefacts, etc., may symbolically be called a ‘virtual library’ – the total Anthology of the Fluxus Movement. It relates to the Library’s function and mission to bring together the past and the present and conceptualize it in a new and creative manner. On the one hand, Fluxus is already part of the visual art history studies. On the other hand, many ideas of Fluxus, its energy and disregard for stereotypes are becoming more popular today, in the era of neo-liberalism. We must admit that it is a bold step for the National Library to present part of Fluxus collection (artefacts of George Maciunas’ activity) as a modern, innovative cultural institution open to non-standard solutions, yet experienced and related to history. George Maciunas, the leader of Fluxus, is broadly introduced in the exhibition. One of his ‘historical’ collage cycles balancing a fine line between academic research and artistic skill is on display in the Library. The viewer is also presented with the pearls of Maciunas’ graphic design: name cards of Fluxus artists, where their names are rendered as a work of art by using original font. One of the icons of Fluxus is the work No Smoking, which emerged from real life instead of being formally designed – Maciunas hated smoking and smokers. The exhibition also presents other graphic design works, schemes of development of avant-garde art, photo self-portraits, post cards, and several original objects such as the book Reminiscensijos by Jonas Mekas or Anthology Fluxus, which were dressed in wooden covers by Maciunas. In the lifetime of Maciunas, the majority of Fluxus works, objects and artefacts were not signed. This was the expression of the idea of Fluxus collectivism and self-expression accessible to all. Therefore, each artefact, piece of graphic design, poster or postcard, regardless of the Fluxus artist who created it, is always permeated by collective creative spirit and represents Fluxus as a performative entirety of life. However, the majority of what we know and understand about Fluxus, what is important to us is often touched, designed or organised by George Maciunas. Therefore, presenting the most characteristic examples of George Maciunas’ creation means presenting the spirit of Fluxus in general. 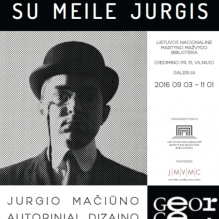 When presenting Fluxus in Lithuania, the first person that comes to mind is George Maciunas. Thus, this exhibition is a postcard from George Maciunas to Vilnius and the reopening Library – with love and a creative charge.